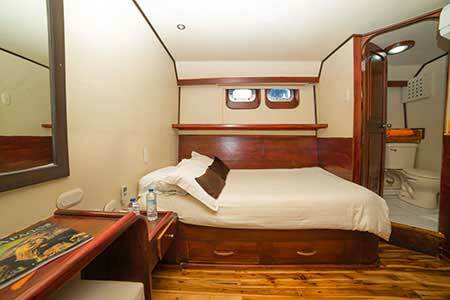 Lower Deck: 4 double cabins (twin beds) 78ft²/ 7m² - 3 double cabins (1 double + 1 bunk beds) 75ft²/7m². 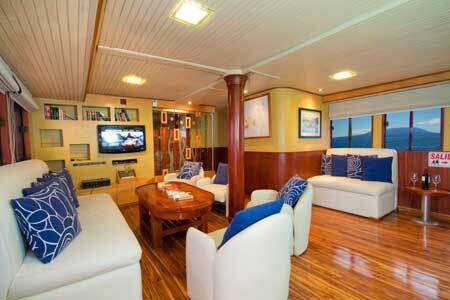 Upper Deck: 2 double cabins (twin beds) 74ft²/ 7m². Safety & Navigation: All equipments meet / exceed the international safety standards, Life vests, GPS, Sonar, Naval radars, Fire detection and prevention systems. 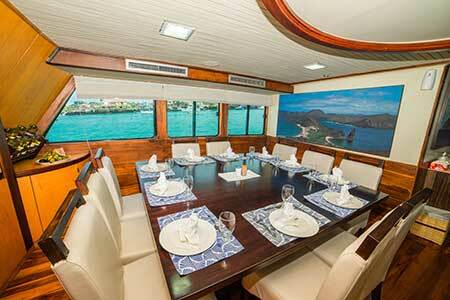 Please ask your Trip advisor for information on 10-Day, 15-Day Cruise itineraries for this boat. Just a note to thank you for all your hard work making sure the Wynne's were well taken care of on our trip to Quito and the Galapagos Islands. Thanks to you, everything went very smoothly - transfers and trip. We all loved our trip to the Islands. The wildlife and views were amazing and watching an active volcano was a wonderful bonus we didn't expect and will never forget - a once in a lifetime experience. Our day in Quito was really special, too. We started at the crafts market followed by the old downtown square and visits to a museum and three of your beautiful churches. Food was great wherever we went and the Mercure Hotel was lovely and the hotel staff couldn't have been nicer. Thanks for a wonderful family vacation. I am very well thanks, I hope you are too. The trip was absolutely incredible. First of all, the rest of the passengers on the Galaven were all extremely nice people and everyone got on really well which was very lucky for me and made the trip even more enjoyable. Our guides Eric and Victor were both incredible. They were so knowledgeable and passionate and I felt more like a friend than a customer. They really made the trip so incredible. The itinerary was amazing and we were even lucky enough for the captain to stop to let us see Sierra Negra erupting on the western side of Isabela which was a once in a lifetime experience. The only downside for me on the itinerary was visiting two tortoise breeding centres which were very similar, but I understand it is not always possible to include many different things! This trip really lived up to my expectations in every way and will be something I will never forget. We have arrived back in Adelaide after a wonderful holiday, part of which was the Galapagos which we both thoroughly enjoyed. We’d like to thank you for your efforts in regard to our booking for the Galapagos - it all wen't very smoothly with no problems with our bookings. It was also good to finally meet up with you after so many months of corresponding by email. There is no doubt the Galapagos is a very special place ad we feel so lucky to have finally spent some time there. The crew and the guides on the Galaven were very attentive and friendly and helped to make the experience so pleasurable for us. 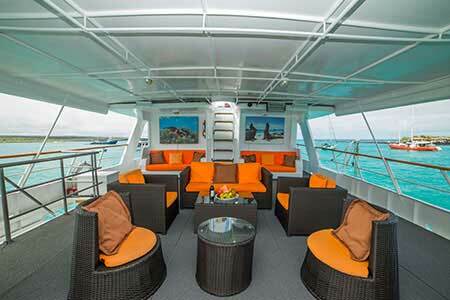 We would have no hesitation in recommending your company to others who may make the trip in the future. Trip went smoothly. Everything was set up perfectly. We enjoyed the Galaven staff and the sights and experience in the Islands. Just wanted to let you know how much we enjoyed our trip to your incredible Galapagos Islands. It was truly a once in a lifetime experience that we will not forget. The crew on the Galaven were so friendly. And the two naturalists, Erik and Enrique were outstabding, very knowledgeable and always ready to answer all our questions. 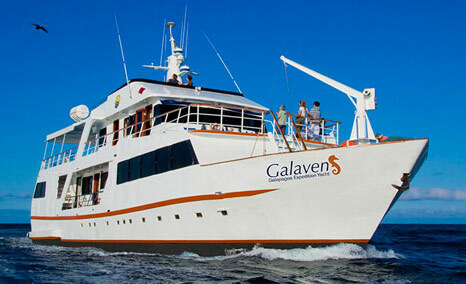 We would like to thank you for the beautiful trip that we had with the Galaven crew in the Galapagos. It's over our expectations. So thank you for your help to arrange this trip. Thank you so much for the wonderful, efficient job you did with our trip to Ecuador!!! It more than met our (Susan and me) expectations. The tour on Monday in Quito was extraordinary. The staff could not do enough for me. Because of my age, they took special good care of me. They even had a crew member go with me on 2 of the islands to make sure I could walk without falling. Met wonderful people and had lots of laughs. It was hard to leave. Only had one glitz: the flight from Santa Cristobal was several hours late. But the other flight was held. Again, many thanks for a wonderful trip and many memories. I wanted to thank you very much for helping us plan our incredible trip. It was fantastic. The cruise could not have been better. The crew was excellent. Eric and Pato were incredible guides. The food was great, the cabins small but kept neat and clean, everything was organized and well run! The itinerary was perfect and we saw everything we wanted to see. It was the trip of a life time and we were so impressed with the service you all provided. Daniela met us at the airport and she was wonderful. Helpful and professional. She helped me get cabin 5 as I had been promised. 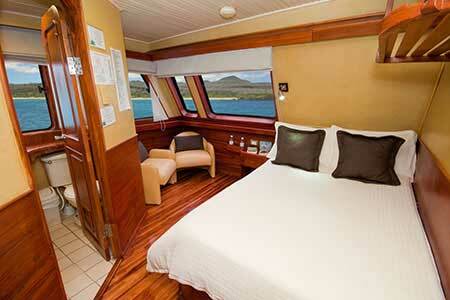 I was very impressed when we arrived in the Galapagos and the guides knew of the cabin situation and had made the change. As you can tell, I have only good things to say about your company and the cruise. Thank you for all your help. Please let all the others know how impressed and pleased we were. Our trip to Galapagos was superb. Our contact at the Quito airport found us, spoke perfect English and got all necessary paperwork done perfectly. We were very happy with the Galaven Expedition boat. The 2 guides were excellent, the boat very clean and the food amazingly high in both the quality and variety. We booked our trip at the last minute and were so pleased at how smoothly everything went. Thank you so much. Want to thank you for all of your assistance in making our travel plans for Ecuador. It was a wonderful trip for all four of us. 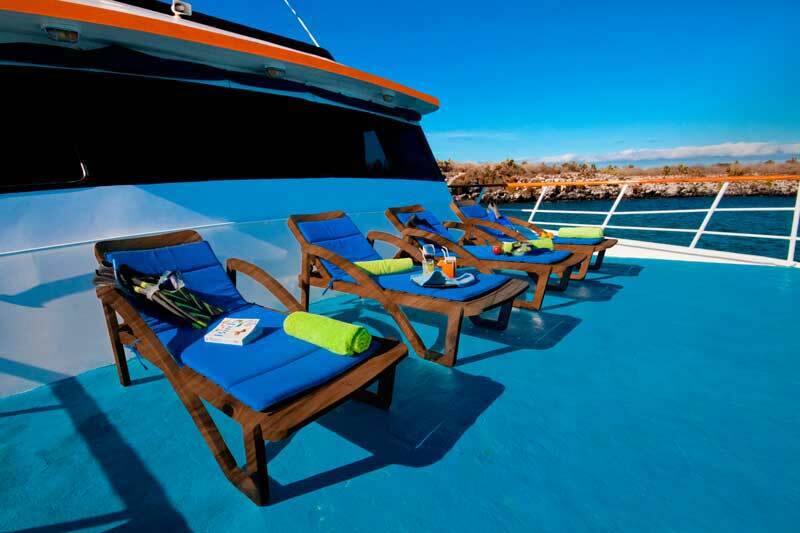 We especially enjoyed the Galapagos, and the Galaven -- it was really memorable. While in the highlands we took several tours, including Ingapirca, equator, etc. and the Amazon experience was really interesting. Thank you again for all of your help. Our trip on Galaven was better than we could have hoped. The crew and guides were very helpful and good fun. Nothing was too hard for them. Franklin the younger guide was our favourite as he is widely read and passionate about the islands. The itinerary was busy but inclusive and we saw many lovely and interesting creatures and landscapes. Snorkeling gave more creatures to wonder at. We will recommend this to our friends. We are on our way back to the USA. Just wanted to let you know we had a wonderful time on our Galapagos Trip. It was everything we had imagined. The Galaven was great also. Thank you so much for being such a big part in helping to make our trip work out perfectly. I will definitely contact you if I choose to return to Ecuador. Thanks for your email. Our trip on the Galaven was perfect. We had a wonderful time thanks to the great crew and guides. Billy and Enrique (our guides) were fantastic. We came home with over 1000 pictures of the birds and animals and made some great friends too. Everything at the airport and with transfer to the boat went smoothly. 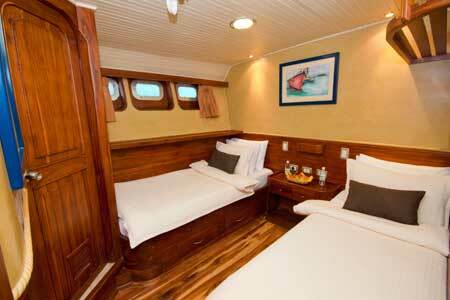 Our cabin was very nice and quite spacious for a boat. Meals were very good. The only thing that could be improved upon were the desserts - didn't always satisfy that "sweet tooth" after a meal. All in all we were very pleased with our trip and I would highly recommend. 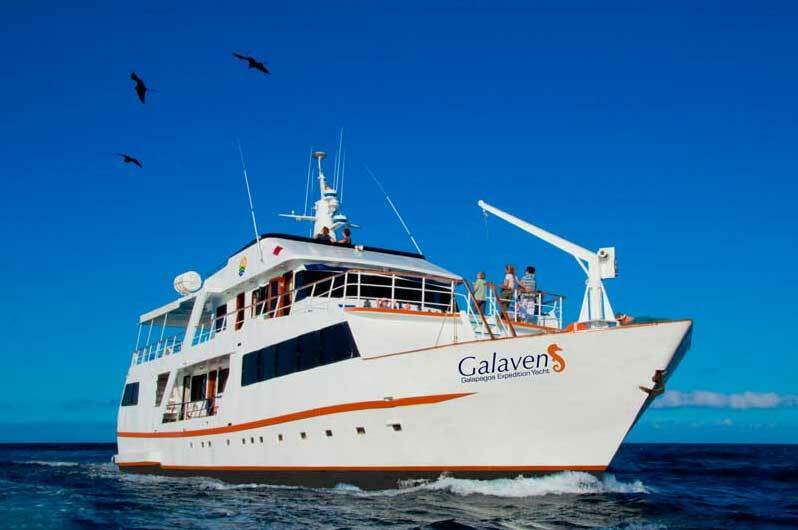 The Galaven cruise to the Galapagos was wonderful! I enjoyed the daily activities, hikes and snorkeling. The food was good, the staff were friendly and knowledgeable and the accommodations were very nice. 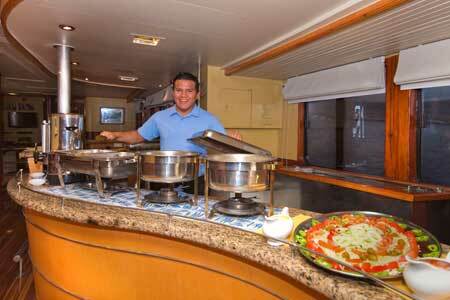 I enjoyed the luxury and cleanliness of the boat along the people joining us on the cruise. Thank you again for your kind assistance. It is a trip my daughter and I will remember for a lifetime.